The year is 207 B.C. the place is along the banks of the Metaurus River in northern Italy. Hannibal has run rampant through the Italian peninsula since 218 B.C. This battle was picked by Sir Edward Creasy as one to add to his famous book The Fifteen Decisive Battles of the World. Hasdrubal, Hannibal's brother, has lost Spain to Scipio, soon to be Africanus, and is on his way to reinforce Hannibal and finish the war. The Romans have found out about Hasdrubal's whereabouts and have succeeded in hoodwinking Hannibal, and have slipped away to attack Hasdrubal's army. The Romans are led by Marcus Livius and Gaius Claudius Nero. Nero has marched almost the entire length of Italy post haste to be part of the battle. The Romans succeeded in destroying Hasdubal's army and ending Hannibal's chances for a victory. The game comes in a standard folio series size ziplock bag. 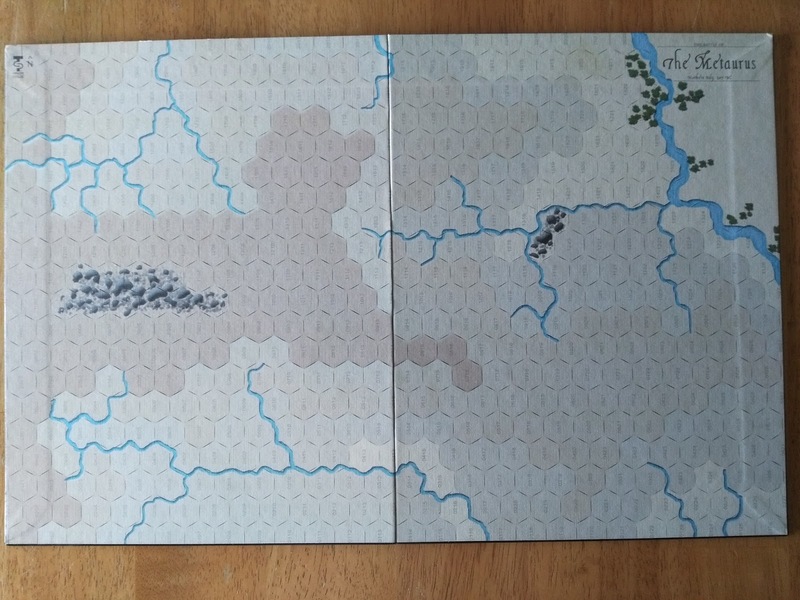 The game is part of TPS' "Twenty Decisive battles of the World' series of games based on Creasy's book with additional battles added. As stated, the map is mounted, which is a very nice touch that TPS includes in this series. For this price and size you almost always get a paper map with a game. The map is also well done with the rivers, streams, and heights well defined. It is a typical closed hex map. You have to supply a ten-sided die, or use the 0-9 chit counters supplied for both sides. 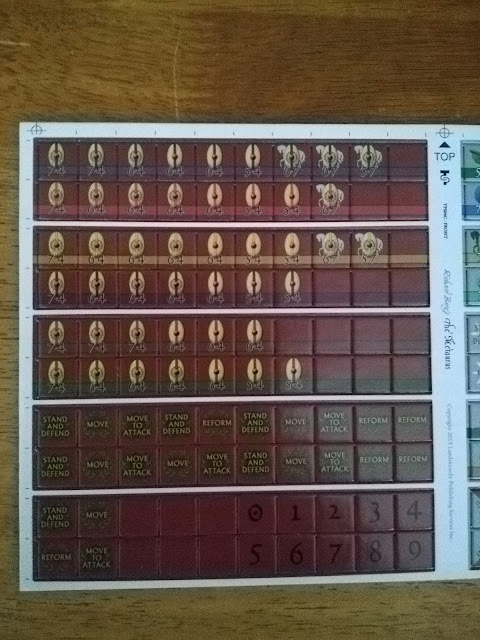 The counters are of a gray background for the Carthaginians, and a red one for the Romans. The background doesn't drown out the counter illustrations, and the morale rating and movement allowance are very easy to see. The Carthaginians have one elephant counter, and that also comes with the prerequisite of the possibility of the elephants going berserk. The ancient battles that have elephants always have that extra fog of war: who are these behemoths going to trample, friend or enemy? The game rules also throw the Hasdrubal player a curve ball with his newly raised Celtic Gauls. The Gauls may or may not follow their orders, and to top it off they have low morale ratings. In a change from most ancient games there are no missile troops to command. The sources only mention a few slingers on the Carthaginian side, and the hex size (200 yards) precludes it. Just as it was historically, the Carthaginians have less troops than the Romans. The Romans also have better troops with higher morale ratings. The Carthaginians do have a slightly better position to start in. 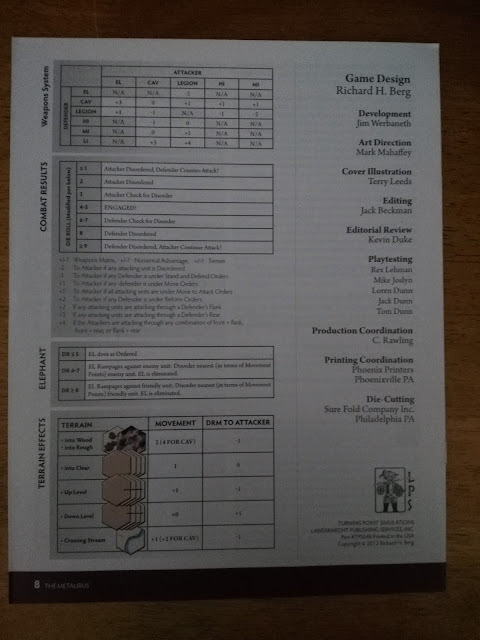 The initiative is decided by a roll of the die or pull of the chit. The higher number wins, and ties are redone until there is a winner. There is no stacking allowed at any time. 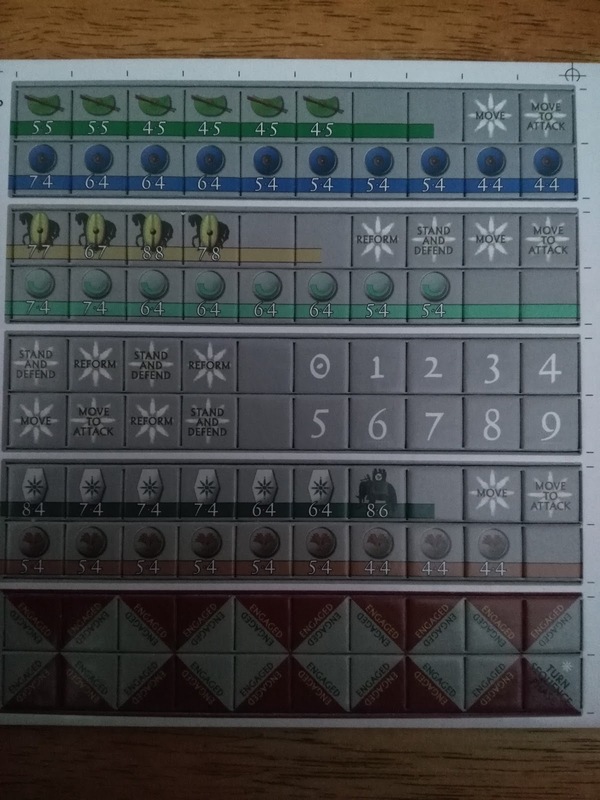 Naturally status markers do not count toward stacking. There are six Roman legions and each can be issued commands separately. The Carthaginian player has four separate unit groups to give commands to. These four units are all infantry. The Carthaginian cavalry and elephants do not require you to issue them orders. As in most depictions of ancient battles this game has a facing rule. The facing can be disregarded during movement, but the counter has to face one of the vertices of the hex at the end of movement. It also does not cost movement points to change facing. Attacking an opponent's flank or rear gives the attacker a bonus on the combat results table. Terrain also gives the attacker either a bonus or a minus when deciding the die roll on the combat results table. The games victory conditions are straightforward. The Roman player has to eliminate nineteen Carthaginian units (Light Infantry and Elephants do not count) before he loses 12 of his own units. 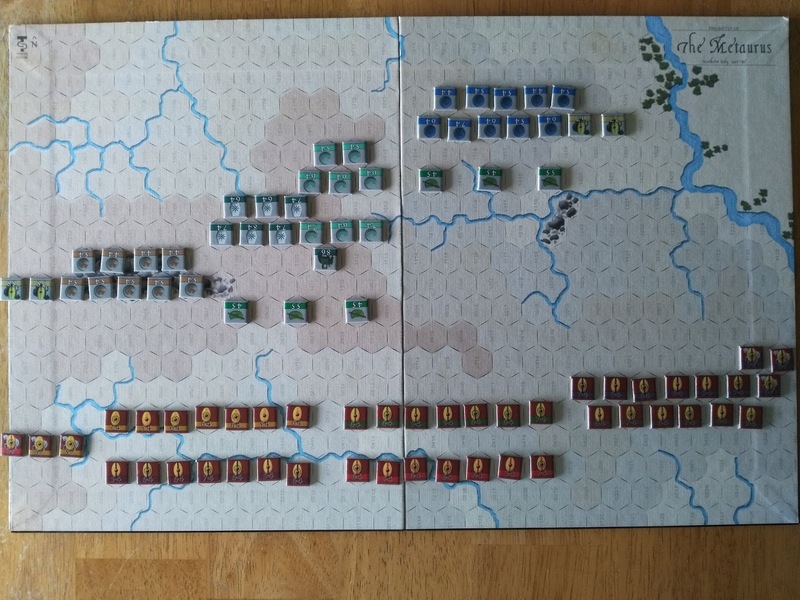 If the Carthaginian player can exit twenty units off the south edge of the map before the Roman player can eliminate nineteen of his units, the Carthaginian player wins. The only sort of odd rule for setup and play is that all of the numbered half-hexes on the map edges are fully playable. The game was designed by the venerable Richard H. Berg, so you can be sure the rules are intelligible, and all make perfect sense. The small footprint and counter amount makes this a great game for people who need a small footprint, and cannot leave a game up except during play. The Carthaginian player is faced with very long odds to either win straight up or get twenty of his units off the south edge. I would suggest that the player with more experience play the Carthaginians. 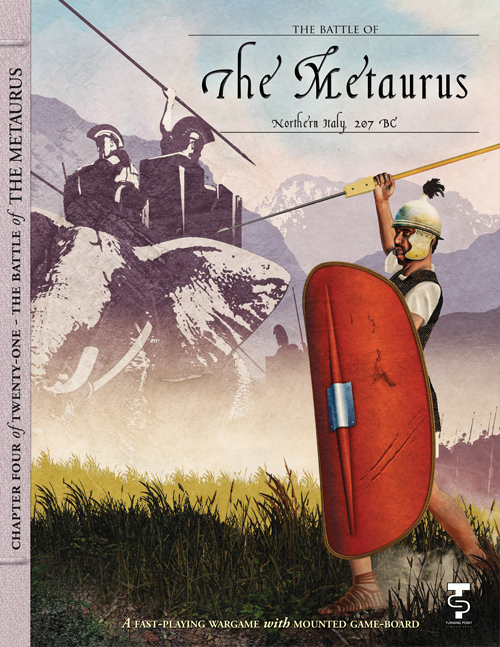 The optional rule about the chance of the Gauls under Hasdrubal having to pass a die roll check for movement or attack can also be ignored to give the Carthaginian player more of a chance. In my play-throughs, the Romans invariably win most of the time. The victory conditions have been modified to make it harder for the Romans to win, but still being able to win as the Carthaginians is not an easy task. The decision to go with greater hex size and remove missile combat makes this a quick playing ancients game. For any gamer interested in a fast playing low complexity wargame, here it is. 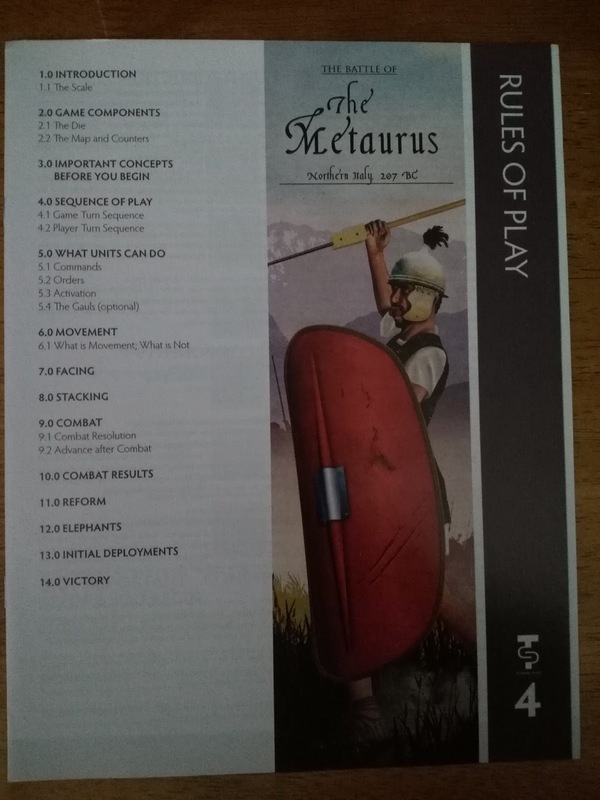 I actually stole "fast playing and low complexity" from the rules book, but it is very apt.